Auzbilt Transportable Buildings specialises in the design & construction of quality portable buildings & storage solutions and are well established in the Latrobe Valley Victoria where we strive to complete all projects on time & within budget. 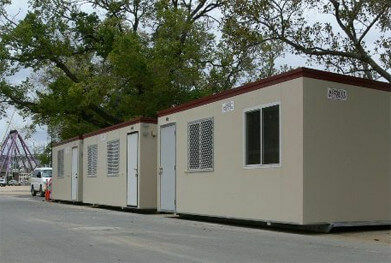 Speak to us about the wide range of options available to suit your exact needs, whether it be for Industrial, mining, government, agriculture, sport & recreation or special events and we can manufacture high quality portable buildings for sale or hire with competitive pricing & quick response time. We supply both new & used portable buildings as well as shipping containers to suit most applications, with a wide range of custom options on new units, means we can cater for all budgets & requirements. Our portable buildings can be configured in many ways & are ideal for construction sites, canteens, offices, temporary accommodation units, toilet & ablution blocks, disabled toilets & showers, security booths, land sales offices communication transmission huts etc.